Loved the whole issue as usual, but I was particularly impressed with the portrait series, “Recovering” [March, 2016]. The folks who put their stories out there in the hope of helping others with overdose and addiction issues are indeed very courageous. The stigma affixed to alcoholism and drug addiction can be so devastating and I admire those who have the fortitude to bring their lives out into the open. I’m always surprised that the usual portrait is of a skid-row type person but in actuality many substance abusers are businesspeople, professionals and hard-working citizens like those highlighted in your article. Good job. I really enjoyed, also, the In Their Own Words article on Patricia Schappler [March, 2016]. What an amazing artist. Where is it possible to see more of her work? Thanks once again. Nothing like a good read in this dreary weather. Editor’s Note: Patricia’s website is a great place to start. Do you really think readers (especially the visually impaired) can read the print by the photos on the article “Recovering” starting on page 46? Light gray on white just doesn’t work. Please be more sensitive to your subscribers. I read your March article [“An Unplugged Guide to Energy”] and was surprised at not seeing anything about the hydro plants that dot New Hampshire. Don’t they count anymore? My father put 50 years with PSNH all in hydro (retired about 1983). I’m certain they are all still working. What about NH/Vermont/Maine hydro — can’t we do it as well as the Canadians? Editor’s Note: We asked the writer of the story, Sam Evans-Brown, to respond. Here’s his reply: Hydro in New Hampshire is the wallpaper: someone put it up before anyone can remember, you never notice it and it would be too much work to take it down, but it does keep things from looking too dingy (New England gets 7 percent of its energy carbon free thanks to it!). Hydro is not an ideal solution, though. It disrupts river ecosystems and makes life difficult or impossible for some fish. You made a bad decision in putting a picture of a doctor on your cover for this [April, 2016] issue. There is nothing about her picture that would make us think quintessential New Hampshire. I realize the focus of this issue is healthcare, but it is also about Star Island and local lamb. Surely you could have found one of those pictures suitable for the cover. 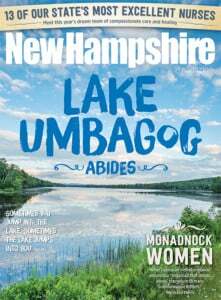 We are former long-time subscribers of Vermont Life Magazine, and for the same reason we canceled our subscription. I’m sure you could have found a more appropriate picture for springtime in New Hampshire. I just wanted to let you know what fantastic feedback we are getting on the story on Star Island that Candace Gendron and Rick Broussard put together [“Guiding Star” March, 2016]. It was excellent reporting, writing and photography. It truly captured the unique qualities at Star Island. You have a great team! You missed the boat, guys. The Isles of Shoals and in particular Star Island have a long history of meaningful time spent on ledges six miles off the coast of New Hampshire. My wife, Judy, and I met on the boat to Star in 1941. We are both 92 years old and the Star Island experience must have something to do with a 69-year marriage. While your writers gave space to the location of the Isles of Shoals and its beauty, they missed the spirit of Star and what it meant to so many. There was no mention of the nightly procession to the tiny chapel holding a candle and shielding it from the wind, for example. There were daily discussion groups or lectures or workshops. We can’t recall the topics, but do remember the surf, the gulls and setting suns. An incoming boat was met by a contingent of greeters and the same was true when a boat left to return to the mainland, with song or chant. I have a double reason to remember the Isles of Shoals as I was on a submarine during WWII and the USS Squalus sunk off the Shoals in 1939. The ship was brought to the surface, repaired and refurbished and sent back to sea and duty as the Sailfish. There is more to that story, but that was not the intent of your Star Island article. One more item your readers might share was the $23 room and board charge for the week [back in 1941]. Water was limited for washing, but the sun, rain and surf helped to keep everybody smelling the same as their week wore on. Editor’s Note: You’ll be pleased to know the islanders still chant and sing for each arriving or departing vessel. Great “Wheels” column by Rick Mastin in the April issue. We were two of those bikes out on Christmas day. Did a 100-mile loop around the lake and saw smiling boaters enjoying Alton Bay’s open water. Also had a great ride on that rarest of winter days, February 29th.